REALTOR® ABR, MRP, USMC Ret. #2 Sales Associate in 2017! Doreen has been an award-winning REALTOR® since 2004 with the #1 Coldwell Banker Office in Virginia. Doreen services several counties surrounding the I-95 corridor in Stafford Virginia. Doreen is a retired military officer and graduate of Hawaii Pacific University. 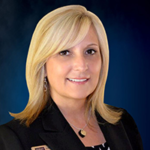 She specializes in military and corporate relocation, foreclosures, short sales, residential home sales, and new home sales. She also loves working with first time home buyers! She holds the Accredited Buyer Representation (ABR) Designation and is a certified Military Relocation Professional (MRP). SHE HAS ALWAYS MEASURED HER SUCCESSES BY THE QUALITY OF CARE, NOT THE QUANTITY OF CLIENTS!! Doreen tailors her efforts to each Buyer and Seller, and is committed to being her clients’ greatest advocate, always keeping their interests her top priority. Rest assured, you will receive an unparalleled experience, managed solutions to challenges that may arise, and guidance aligned to your best interests. In addition, Doreen is a great communicator who believes you should always be able to contact your REALTOR® right away. After all, how many times do you buy or sell a home in your lifetime? This is definitely a major event for any buyer or seller! There are key attributes that Doreen prides herself on, and those are; being honest, trustworthy, and knowledgeable in the real estate market so she can best serve your needs. Doreen knows how important it is to find your dream home or get the very best offer for your property. Doreen is also committed to staying on-top of technology and using the best tools available to you. Doreen holds a BSBA in Management from Hawaii Pacific University. On a personal note, Doreen was recognized as a Distinguished Shooter during her 23 year Marine Corps career by earning the Distinguished Marksman Badge as a Rifle Shooter. An honor only 7 women had accomplished at the time of her retirement from the Marine Corps. She loves animals, enjoys travel, boating, and spending time with her family and friends. Doreen is committed to helping and honoring the men and women who serve our military. Furthermore, Doreen believes all animals deserve the perfect home too! If any of her clients who purchase a home want to adopt a new pet from a local shelter or animal rescue organization, she covers the cost! If you are looking for a sales associate that is focused on you, stays on top of everything, easy to get a hold of, attentive to your needs 24/7, then Doreen is your agent! Additional testimonials can be found at her Zillow Page, Facebook Page, or website.